Comments: A half dozen winter records would be considered a major “invasion” of snowy owls in Kansas. 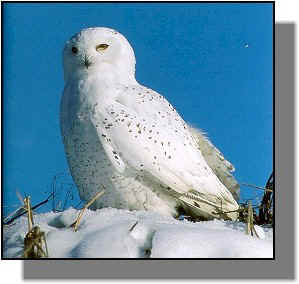 During many winters no snowy owls are found. The whitest birds, some nearly pure white, are males. The plumage of females are more heavily spotted and barred. From a distance some females may appear almost gray. Watch for them at Cheyenne Bottoms and in open country around large reservoirs. Distribution: The snowy owl is a circumpolar arctic resident. It breeds north of the tree line in tundra habitat. It occurs in Kansas only when failing food supplies force birds far south of their normal range. Food: Although lemmings are eaten in abundance on its arctic habitat, when in Kansas the owls will eat a variety of mammals and birds.